If you are a vegetable gardener, chances are you have experienced such an abundance of zucchini so great that even a ravenous family of squash lovers could never keep up with it. Right now, the garden is simply loaded with the prolific dark green veggies. And if not, you can pick up baskets full of them at a great price at your local farmers market. Some zucchini trivia: Biologically, zucchinis are closely related to cucumbers and watermelons. Zucchini is technically a fruit and not a vegetable. They have been consumed in Central and South America, as well as Italy, for thousands of years, but only became popular in North America over the past 50 years, perhaps when gardeners realized what a bounty they could receive in a tiny amount of garden space. Zucchini is part of what is known by the Native Americans as the “Three Sisters” – three plants that grow well together – corn, summer squash, and beans. 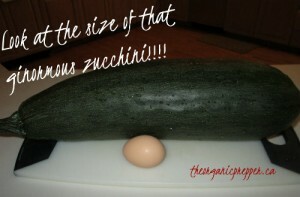 Zucchini is chock full of nutrients! A huge 1 cup serving of zucchini, including the skin, contains: 20 calories, 1.5 grams of protein, 4.2 grams of carbohydrates, and 1.4 grams of fiber. Zucchini was proven in studies to be a top food source for antioxidants such as lutein, zeaxanthin, beta-cryptoxanthin, alpha carotene, and beta carotene. Zucchini is extremely high in natural pectin, which provides protection against diabetes and can help regulate insulin and blood sugar levels. Zucchini contains Vitamins C, B6, B2, A, and K, as well as manganese, potassium, magnesium, folate, and phosphorus. Zucchini is not just easy to grow – it can actually take over your garden if you’re not careful! Some people plant zucchini away from other parts of the garden for this reason. You should allow plenty of room for the vines to spread. If you are using the square foot gardening method, thin to one plant per square foot. Zucchini is one of those multi-purpose harvests that can be used in a variety of ways. Whether you prefer it sweet or savory, there’s a place for zucchini in your kitchen. If you end up with one of the baseball bat zucchinis hiding under the leaves in your garden, cut out the center and remove the seeds. Very large zucchini can become woody and flavorless. 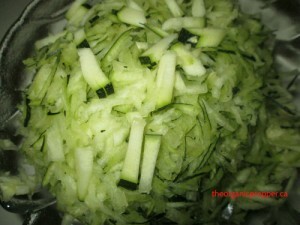 Try using over-large zucchini in recipes that call for shredded zucchini – this helps to mask the texture. Try using shredded zucchini in place of recipes that call for shredded potatoes. 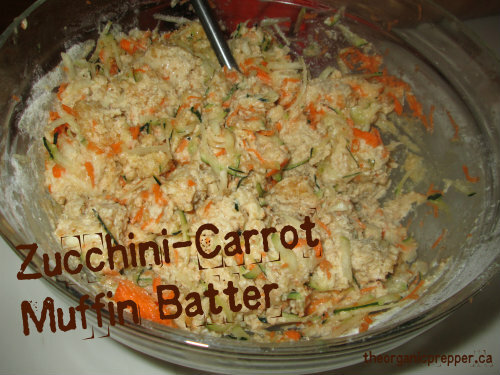 You can also mix shredded zucchini half and half with shredded potatoes to make hash browns or potato patties. Because zucchini is so abundant and the uses are so varied, the recipes for its use are in a separate article…find them below. Slice a zucchini in half and fill it with all manner of sweet or savory fillings to make baked zucchini boats. Uncooked zucchini spears are great for dipping and make a tasty addition to a veggie tray. If the zucchini is a small, tender fruit, you can leave the peel on for an extra hit of fiber. For a bigger zucchini, it’s best to peel it for use raw, because the skin will be tough and unpleasant in texture. With the garden in full zucchini overload, we’ve been scrambling to figure out ways to use it that are just a little different than the usual sauteed or grilled versions. Here are our top, kid-tested recipes. In a large bowl, mix together flour and seasonings. Stir in zucchini and cheese, using your hands to combine well. Meanwhile, heat the cooking oil until it sizzles when a drop of water is added. 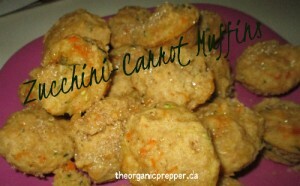 Form the zucchini mixture into patties and place them in the hot oil, taking care not to splatter yourself. Fry on each side for about 3-4 minutes or until a dark golden brown. Drain the fritters on a paper towel. 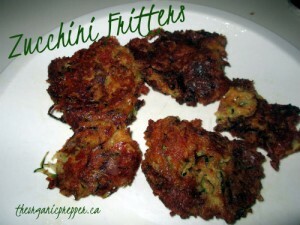 Form the zucchini fritters as instructed above. Place the fritters on the cookie sheet and brush them lightly with oil. Bake for approximately 10 minutes on each side or until dark golden brown. With a fork, mix seasoning into yogurt. Place in the refrigerator for at least one hour to allow flavor to develop. 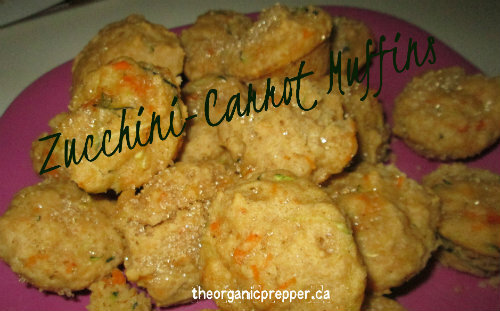 Serve with fresh veggies or zucchini fritters. Grease muffin tin with butter or additional coconut oil. In a small bowl, add the vinegar to the milk and allow it to sit for 5 minutes. In a large bowl, mix together oil, sugar, and vanilla, then stir in the milk mixture, the carrots, and the zucchini. In another bowl mix together flours, spices, salt, baking powder, and baking soda. Stir the dry ingredients into the wet ingredients until just combined – you will have a lumpy batter. Let the batter sit for 10 minutes to allow it to rise. Spoon the batter into the prepared muffin tin, sprinkle lightly with turbinado sugar, and then bake for 20 minutes or until a knife inserted in the middle comes out clean. Line a baking sheet with tinfoil, then lightly spray it with oil. 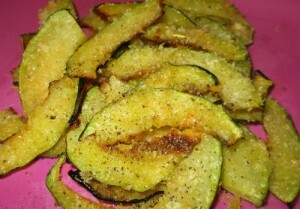 Place the zucchini on the baking sheet then lightly brush with olive oil. In a bowl, mix together Parmesan, bread crumbs, salt, and pepper. Sprinkle the mixture on top of the zucchini slices. Bake until the zucchini is browned and crisp, about 25 minutes. 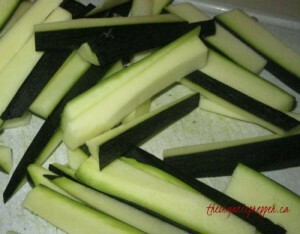 Cut the stem off the zucchinis, then use a mandolin to slice them into long thin ribbons. They should be about 1/8 inch thick, if they're too thin they won't stand up on the own, but if they're too thick, they won't be flexible enough to roll. Give each one a little sprinkle on both sides with salt and pepper. 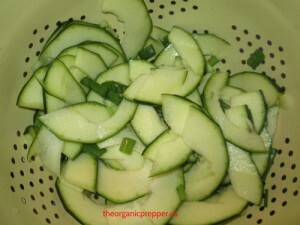 Zucchini can be dehydrated either in thin slices or shredded. Either way, prep your zucchini, then mix well with salt. Place the salted zucchini in a colander over a bowl and put it in the refrigerator for a minimum of two hours. (I usually leave it overnight). This will remove a great deal of the moisture. Put a thin layer of zucchini on the shelves of your dehydrator and dry overnight on low, or until the zucchini is completely dry. When you’re ready to use it, reconstitute it by covering it in boiling water for 15 minutes. 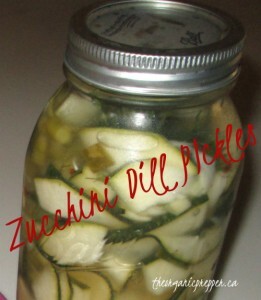 Drain and use as you would fresh zucchini. Unlike most vegetables, there is no need to blanch zucchini before freezing it. Simply shred it, drain it (don’t add salt in case you want to use it in sweet dishes like zucchini bread or muffins) and then place it on a cookie sheet in a single layer. Put this in the freezer for two hours, then relocate the frozen shreds into large freezer bags. Zucchini really doesn’t take to canning well. However, you can use it in place of cucumbers for your favorite pickle or relish recipes. The large zucchinis that are a little bit tougher actually work better for zucchini pickles because they hold their firmness better. If you don’t have a favorite pickle recipe, you can try putting up some jars of this spicy sweet pickle. Thinly slice your zucchini (about 1/4 inch or less in thickness). Salt the zucchini, add the onion slices, and place it in a colander over a bowl in the refrigerator for 2 hours to remove the liquid. Meanwhile place into each sanitized jar: 1 tsp of salt, 1 red chili, 1 clove of garlic, and 1 sprig of dill. In a saucepan on the stove, combine sugar, vinegars, turmeric, mustard seeds, and peppercorns. Bring to a boil. Making sure the jars are still warm from being sanitized, fill them with drained zucchini and onion mixture, allowing 1 inch of headspace. Pour the boiling liquid over the contents of the jar. Wipe the rims and cap your jars with snap lids and rings. Process in a water bath canner for 15 minutes (pints), making adjustments for your altitude.